As a fun Christmas special we took our 3/4 Cape Cod House and redesigned it into a Santa’s Workshop. We changed the siding to brick around the first floor and stucco with red trims for the second floor and dormers. The chimney has been moved so it runs up the outside wall. 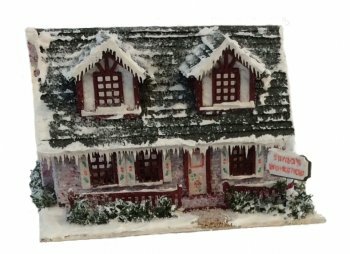 We have added the Santa’s Workshop sign and icicle trims around the roof edges. In order to give it that extra holiday look we have etched holly leaves and candy canes patterns in the shutters and door. Of course since the elves need places to build and store the toys, we have included a shelf unit for the toys and three work tables with benches. The structural pieces are laser cut out of maple hardwood. The kit includes the base, two floors that are etched to resemble hardwood flooring, and parts for two dormers. The exterior materials include engraved brick, stucco paper, wood trims, shingles, icicle trims, railings, chimney, and the sign with post. The interior materials include wallpaper, materials for beamed ceiling, fireplace, baseboards, and trims for the edges of the walls and floors. Also included are all laser cut parts for doors, window casings, window frames, shutters, one shelf unit for toys, and three work tables with benches. Landscaping materials include snowflakes, gravel, and bushes. * The product used to build up the snow is called flex paste and is Not included. The step by step instructions are detailed with diagrams and pictures.